OpenTRV archival data format, radio/wire comms format, and other issues. Discussions and decisions on IRC, including that TinyHAN MAC should be preferred local RF MAC layer, we will use it to support JSON-/Mike-/binary- format frames, all full timestamps at and beyond the concentrator to be in unambiguous ISO-8601 UTC with variable precision from just years down to many decimals of seconds as appropriate to the data. Text for rapid dev and less technical users (makers and the Arduino target audience) and allowing introduction of new keys units and values at will without breaking tolerant receivers, vs compact hand-crafted binary for production by engineers. Energy/size/duty-cycle/bandwidth constraints of low-power leaf nodes and radio modules. Handling of authentication and encryption where needed. Pairing, key exchange other shared secrets and entropy. OpenTRV current single sliding security sensitivity scale, eg 'calling for heat' low sensitivity, temp medium, occupancy high. Making it easy for non-experts and experts to get security right by default. Node IDs (variable length prefixes of 64-bit binary value, compatible with FS20! Current FS20 carrier, misuse by DHD, and FS20 wire format. Other possible carriers such as DECT, ISM GSFK, etc. Use of third-party backhaul eg Neul, SigFox, GSM telemetry. Very low bandwidth or expensive channels such as HF. Radio restrictions/availability elsewhere in EU on ISM. Leaf-to-node terseness vs expansion at node, timestamping, etc. Generic IoT vs OpenTRV use. Not sending all parameters all of the time; to save bandwidth, stay within max frame length, reflect changes (with periodic refresh). Two-way comms, actuators, over-the-air updates, etc. Making data easy to publish in repositories such as Xively, Thingful, etc. (C/o Tim Small): send node type info (I'm a Vendor X, ID Y, standard type 42 sensor) once (or occasionally to help concentrator and downstream know what it's getting. For units, what about using the UCUM codes? http://unitsofmeasure.org/trac/ ? 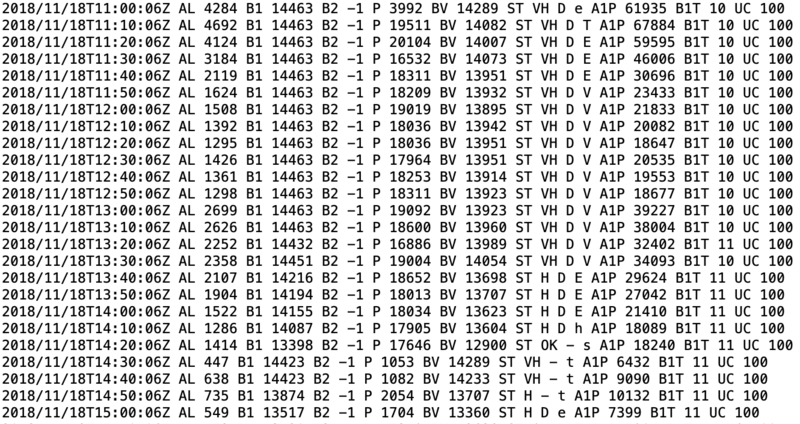 JSON and binary format frames with Mike's MAC can probably be 50+ bytes and work with current typical 64-byte radio module buffers. See the IRC transcript for the session of the evening of 2014/11/13. ... and we will use it to support JSON-/Mike-/binary- format frames (Mike format draft spec: Mike's copy and local copy filed 2014/11/13). ... and with variable precision from just years down to many decimals of seconds as appropriate to the data, ie truncated on the right, with years always 4-digit; week notation also allowed. As of 2018 we're fairly content with our use of JSON and something close to UCUM for over-the-air real-time data and long-term storage, and secure enough (AES-GCM protected) frames to be safely tunnelable through a data relay and across the Internet, at least for now! 2014/11/06 Binary vs Text, 60 chars max. 2014/10/19 Wire formats from low-power sensor leaf nodes to more powerful upstream (concentrator) node including text for rapid development and easy addition of brand new sensors and for non-specialist-programmers. First published 2014-11-07 , updated 2019-04-17 , rebuilt 2019-04-23 . Site copyright © 2007-2019 Damon Hart-Davis. Hosted by ExNet.